“Shakespeare” the Pen Name was Political! During the first forty years of his life, Edward de Vere, seventeenth Earl of Oxford wrote highly successful “comedies” staged at the Elizabethan royal court. He wrote elegant prose as well as poetry and, too, helped save the Blackfriars playhouse while actively patronizing play companies and writers. Only after turning forty-three in 1593 did he adopt “Shakespeare” — a pen name to which, via the dedications of Venus and Adonis and Lucrece, he deliberately and boldly linked nineteen-year-old Henry Wriothesley, third Earl of Southampton. Southampton is the only individual to whom “Shakespeare” dedicated his work. This is the starting point for any theory that Oxford deliberately used “William Shakespeare” as the printed signature to those dedications. It means the Earl got along for more than four decades writing anonymously or under fictional names or the names of real individuals. Then, in the early 1590s, just when the power struggle over control of the succession to Elizabeth on the English throne had begun in earnest, and when Southampton was coming of age at court, Oxford used this military-sounding name to conjure the image of a poet shaking the spear of his pen on the dedicatee’s behalf. In the first dedication he referred to “the world’s hopeful expectation” for Southampton, echoing the king’s image of his son Prince Hal in 1 Henry IV (3.2.36) as “the hope and expectation of thy time” — that is, as the future Henry the Fifth of England. Why did he use this particular pen name? Why did he choose to adopt it on his published poems? Why did he link it to Henry Wriothesley? Why did he introduce the pen name in 1593 and not before? What did he mean when he wrote that “what I have to do is yours”? There is only one correct answer — not to mention the only one that will enable Oxford’s proponents to persuade the world that he was the author. The answer involves politics, policy and power, within the historical context of 1593 and the contemporary history that led to the succession of a foreigner, King James of Scotland, in the same way that Fortinbras of Norway arrives to claim the throne of Denmark in place of the true prince. Oxford’s intentions were political. He was publicly taking Southampton’s side in the deadly political end game of the Tudor dynasty. He was putting the weight and influence of his writings as “Shakespeare” behind Southampton and his political goals … to avoid for England the tragic ending that he rendered in Hamlet. He would continue to use “Shakespeare” in Southampton’s support until February 7, 1601, when conspirators of the coming Essex Rebellion, led by Robert Devereux, second Earl of Essex and Southampton, enlisted the Lord Chamberlain’s men to play Richard II at the Globe. Whatever the Essex camp hoped to gain by this special performance of a play dramatizing the deposition of a king, clearly their motive was political and clearly “Shakespeare” was involved. “I am Richard the Second,” the Queen reportedly said six months after the failed Rebellion of February 8, 1601 had led to the destruction and execution of Essex and to Southampton’s death sentence followed by perpetual imprisonment. The reason why Oxford’s authorship had to be covered up in the decades that followed? The answer is that those in power feared that Southampton’s claim as Henry IX of England would be revealed, leading to a rising against James followed by civil war. 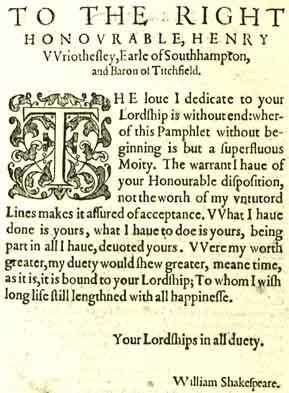 — the relationship of “pamphlet” to (Latin) ‘libellus’: ‘a little book’; ‘a satire, libel’. Lucrece has a political motive. — the relationship of “honorable” disposition to (L.) ‘mores’: ‘customary, lawful’. We are to discover the lawful disposition of Henry Wriothesley. — the relationship of “worth” to (L.) ‘versus’ and Vere. A ‘turned’ Vere will not support that lawful claim. Where should we look for evidence of a claim? — wordplay on Tudor with ‘un-tutor-ed’, i.e. un-Tudor-ed. The claim would be obvious if not un-Tudor’d. — wordplay in “what I have done is yours; what I have To do is [y]ours;” somehow there are Tud’ours buried within. — “being (L. Sum) part in all (L. in summa) I have (L. sum, esse)” … ? ‘Some part in summa sum’; what is the ‘Sum’ part in this ‘Mores’ claim? Mike, thanks for this great stuff. Lifting yet another veil. Much appreciated. More and more “Will Shake Speare” sounds to me like a promise of some sort of (likely political) violence–via the pen or sword. I have read this essay one time and again. I suppose this is how Thor’s hammer sounds when blowing on the gates of the theoretical tyranny of academia! Miltonic!